Brooke and I started it all with our decision to get the Ozzie Plan. We'd always meet up at Gate 5. Since she lived and worked in the city, she was always waiting for me to stroll in from the Green Line. We'd dig out tickets from purses and get in the much shorter Gate 5 lines. This particular gate seemed like the best kept secret of Comiskey, even though it was adjacent to parking lots and closest to the Red and Green Lines. 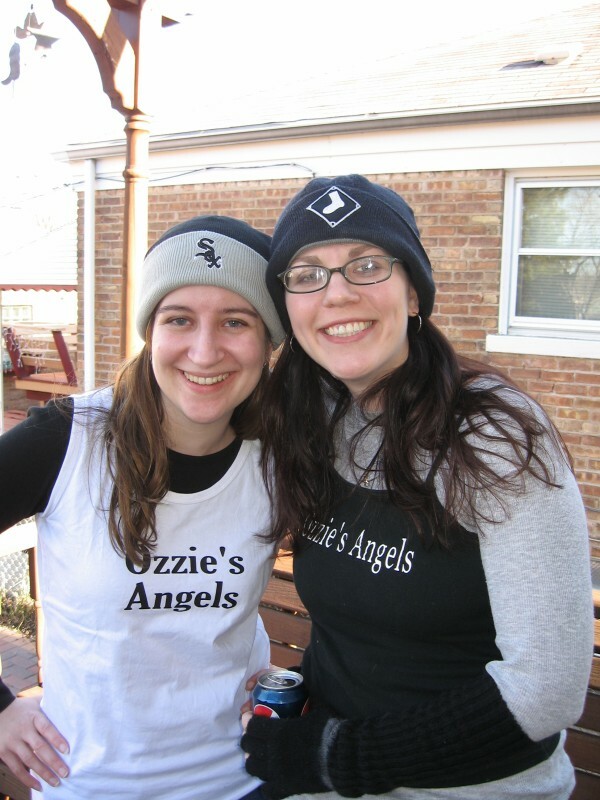 It was the clear meeting place for any game thereafter, whether I went with Brooke or a handful of other Sox fan friends. I don't remember who officially declared us to be the Gate Five Gang but it stuck. Brooke, Mark, Jill, Todd, and me. We were super fans. 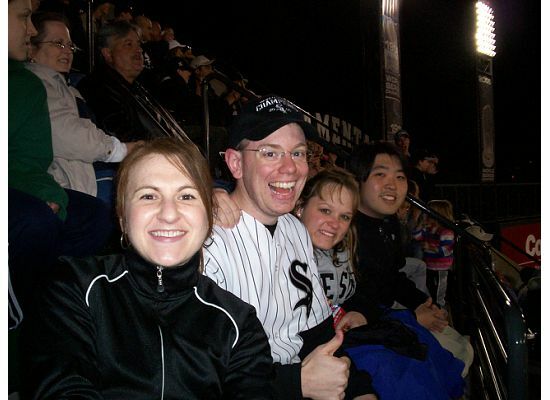 Nay, we were the Best White Sox Fans Ever. We even made t-shirts to prove it. We've gone to many a game in varying combinations but the whole gang has probably only attended one or two games together. Which makes it all the more funny to call ourselves a gang. Whatevs. We make up our own rules on the Southside. Brooke, Jill, and Todd have all since married and started their families. It's a little more complicated for us to all be free to attend a game. Especially since I moved out of state. But I dream of a day when we'll all reunite at The Cell and cheer on our team. With the presence of our collective fandom, the White Sox can't help but win. The Gate 5 Gang has been on my mind with the start of another season. Spring Training imbues baseball fans with hope. We are all optimists at the start. We look at the team and the trades, the strengths and the weaknesses. We look at player performance and figure out gaps but it's all hypothesis at this point. No matter what, we think, "this could be the year." So it is with the White Sox. Paul Konerko is the only vestige from the 2005 World Champion team. I need to spend time familiarizing myself with the new names on the roster. I may not be able to watch many games from here in Nashville but there's nothing like baseball season. Baseball brings people together. We are united in our victories and losses. We prepare for the worst but hope for the best. We keep coming back year after year after year. Because this could be The Year, after all. This is what I love about baseball and life. The sense of possibility. This could be my team's year. It could also be my year. My year of possibility. I need to do my part. I often know what I need to do. It's my turn to step up to the plate. The rest might be out of my control but I'll never know if I hang back and procrastinate or distract myself with other stuff. The Gate 5 Gang teases me about my relentless optimism when it comes to the White Sox. I have an unfailing belief in my team. And yet I so often struggle to apply this sunny disposition to my own prospects. This is my year. This is my chance. I'm taking the first step. I'm taking another leap of faith. No matter the outcome, it will all work for good. Are you excited about baseball season? Are you as optimistic about your prospects as you are for others? I grew up in a world ruled by professional sports, specifically Chicago teams. In my lifetime, the Bears have won the Super Bowl, the Bulls have won several Championships, the White Sox were World Series winners (woohoo! ), and the Blackhawks took home the Stanley Cup. Not too shabby, right? Now I live in a world ruled by the SEC. I tried to navigate this new strange land during the last football season with little success. Don't judge me but I couldn't understand the fuss. I went to a liberal arts college, in which games were attended for social reasons. I did go to an Iowa vs. Illinois game with friends, which was fun, but the fans were tame compared to what I've encountered here. The only way I can understand it is that Southerners are to the SEC as I am to the White Sox. It's a bit strange, from my perspective, that people are rabid about college sports. My neighbor hosts gatherings whenever his team plays- I can tell how the game is going based on the crowd's response. Facebook and Twitter fill with taunts and school pride. The newspaper is filled with coverage. I have to admit, I'm impressed by the dedication. Another football season is upon us. I've decided I no longer want to observe the crazy SEC fans. I want to be one of them. If you can't beat 'em, join 'em. The biggest question then is this. Who do I root for? When I've watched March Madness in the past, I cheered for teams based on the most ridiculous reasons. Like the colors of their uniforms or if they're the underdog. Or if friends were really, really obsessed with their team. So I have no team loyalty. Yet. However, if you look at my track record as a White Sox fan, you know that I'm hyper-loyal, optimistic to a fault, and completely devoted to my team. Here's where you come in. Please comment with your favorite SEC team and why I should root for them over all others. Whoever gives me the best reason- or whichever team has the most fans chime in with their opinion- will determine my new fandom. For fun, if you root for a team that does not play in the SEC, feel free to comment with taunts about the superiority your division/team. It's time for me to embrace this element of Southern living. Now let me see your school pride! Mark and I are firmly friends. We met in 2005, the year of our White Sox. Lest you question the bounds of said friendship, Mark wants to marry a Catholic girl, while I'm in the market for a Protestant boy. Never the twain shall meet. But that's OK because good guy friends are hard to come by. Mark is one of my funniest friends. He's also ridiculously smart and talented. I hope he doesn't ever realize I'm not quite as smart as he is. We've had many great conversations over the years so my smiling and nodding must not have tipped him off quite yet. While we'll talk about many matters of life and faith, our conversations eventually veer toward the White Sox. Invariably I will mention my dream for Aaron Rowand and Jermaine Dye to return to the team. Then he smiles, nods, and pats me on the head. Not really. We both know the chances are unlikely but he finds my enduring bitterness to be humorous. For those of you who are unaware, Jermaine Dye is my favorite player. It doesn't matter that he hasn't been on the team since 2009 or that he officially retired this year. I mean, he was the freaking World Series MVP. Plus, one time while he was warming up, he waved at me. One of the highlights of my White Sox-obsessed life. I wasn't sure it could get any better than this. Oh me of little faith! I was lucky to see Mark a couple of times while I was back in my hometown. Both visits occurred at Landon and Jill's home because I couldn't get enough of my sweet niece-in-love Elena. The first visit, Mark mentioned that he had a treat for me and he'd bring it on Saturday. He refused to tell me what it was, except that it had to do with the White Sox. I thought it would be a bobble head. Saturday afternoon, Mark strolled in and dropped a pink gift bag in my lap. I pushed the tissue paper aside and peered in. I picked up the ball and turned it over, finding Jermaine Dye's signature sprawled across. A smile stretched across my face as I started giggling. "Is this for real?" Mark confirmed it was legit. His friend had worked there and when she left, bequeathed many Sox-related items to him. The next few moments are a blur. My laughter may or may not have turned hysterical. I may or may not have cried, I was so happy. To have an autographed baseball from my favorite, albeit retired, player? Priceless. But you know what made this gift even more precious? That Mark had received the baseball, thought of my love for JD, and passed it on to me. That, my friends, is true friendship. And that is why Mark shall henceforth be known as my Favorite Friend. What is one of the best gifts you've ever received? Are you a baseball fan? I'm sorry. I let you down this year. I should have known better but I got caught up in the moment. Like when you're watching a no-hitter in progress- you know you shouldn't say anything but you wonder, "what if? what if I'm about to witness history?" and then when the streak is botched, you curse yourself for saying anything at all. The home opener started the season off strong. I was so happy to be there- my 11th consecutive home opener with the Bond clan. Our group has changed over the years but we always have a good time. With my move to Nashville just 6 weeks away, this would end up being my only game this year. 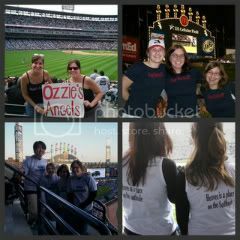 After 5 seasons as an Ozzie Plan ticket holder and a lifetime as a fan, 2010 would be my first season from afar. Still, I had a quiet hope that maybe there would be baseball in October. By then, I'd be well settled in my new job and able to take some time off to come back home and celebrate. Just before I moved, my reign as the Eternal White Sox Optimist was dampened, I suppose, by reality. My beloved team was not playing as well as they should. Even though every other year I've believed that things would turn around, I couldn't muster up the optimism this time. Perhaps I was trying to protect myself from the strangeness of no longer living in Illinois, no longer having access to all the games on TV, or heading down to The Cell. I was frustrated with the players. Part of me thought, this is what happens when you don't keep Jermaine Dye. Or Aaron Rowand. Sorry, I can't let that one go. But then things started heating up again! I was able to watch a game or two each week on TV, cheering my boys on. Who could have imagined we'd be in first place by the end of the first half after an awful spring? I found my optimism coming back in droves. Which, I know, is the mark of a fickle fan but trust me when I say I'm not fickle. I blame it on the fact that I've always been surrounded by Cubs fans- even in Nashville. I came back to the Chicago suburbs the first weekend of August for Jill's wedding. I may have been riding on the high of good baseball, my friend's wedded bliss, and a glass of wine. When the Gate 5 Gang reunited at the wedding, I couldn't help but speak the words that no fan should ever speak in August. I know! I think back now and wonder how I risked jinxing us. I was just so happy! When people asked about Nashville life and when I'd next be home, the standard answer was Christmas. But...my boss had already given me future permission to take time off if the Sox made it to the playoffs. She's a Red Sox fan so she understands all about not making plans in October...just in case. So when people asked about my next visit, I risked it all and said, maybe, just maybe October if we were lucky. OK, I can't take all the blame for why we're not in the playoffs right now. Clearly, the actual players are at fault here. They had the tools to win but didn't win enough. We should have been playing against The Evil Empire this past week instead of the Twins. So I implore you, players, step up to the plate- literally- next year. I'll cheer my heart out but I won't jinx you, I promise. I've learned my lesson. No more post-season talk until we're actually in post-season. Thanks for 2005. 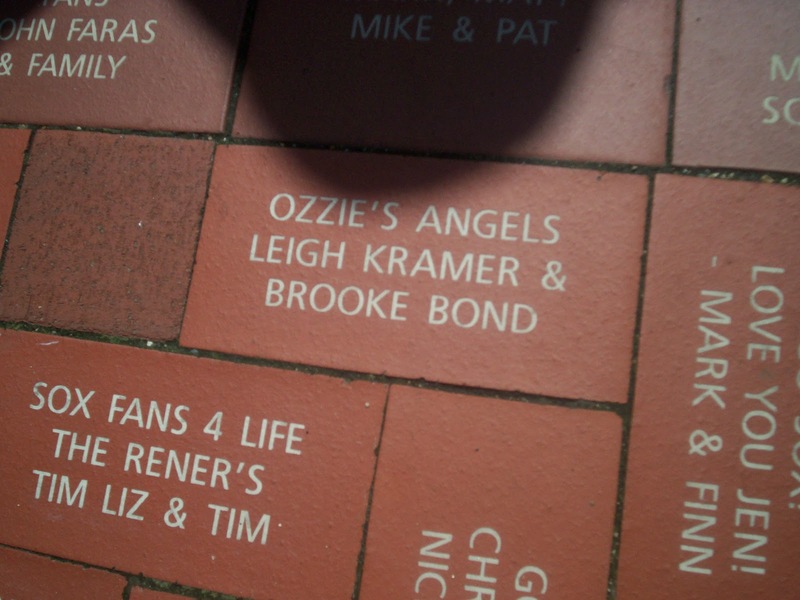 Thanks for letting me be Ozzie's Angel. 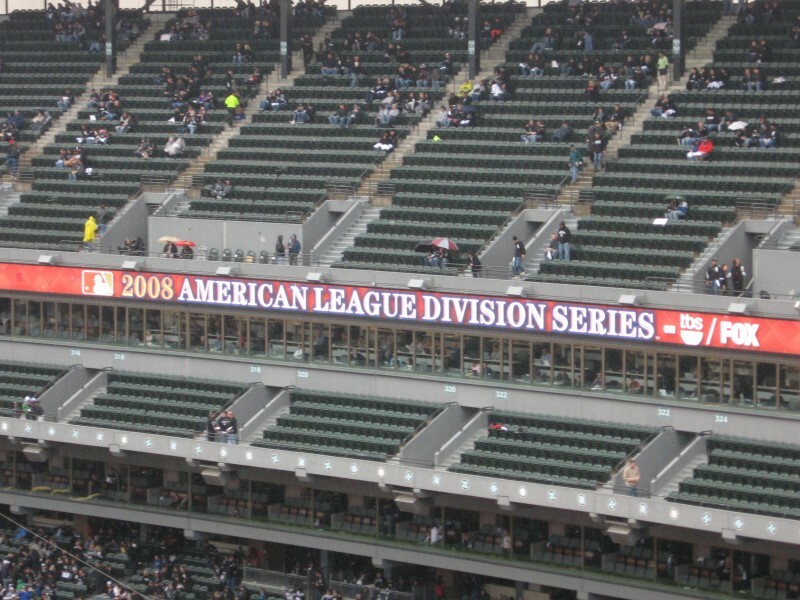 Thanks for winning game 3 of the 2008 ALDS while I was there. Thanks for 88 wins this year, in spite of the ups and downs. Thanks for always being "Back in Black." Thanks for being the best team Chicago has had ever had.